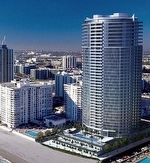 Trump Hollywood on the Beach - The Trump name brings an air of sophistication, of wealth and refinement to any project. Trump Hollywood will is no exception to this rule. 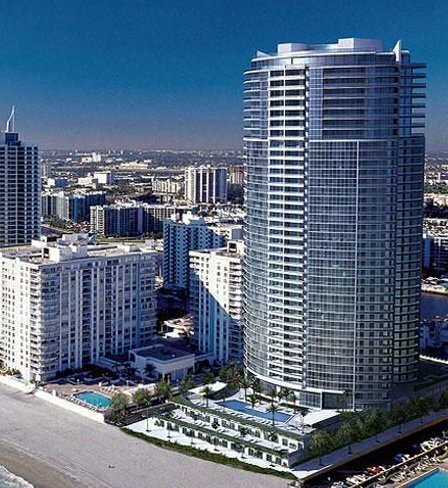 The condo property rises 40 stories above the city of Hollywood, Florida. This ultra-luxury property offers owners a once-in-a-lifetime chance to own a piece of history. This amazing property joins the line up on Hollywood Beach that includes Ocean Palms, Diplomat Residences, Positano Beach and the new Apogee Beach. However, Trump Hollywood is set to 'Trump' them all. The incredible building is home to 200 residences, as well as 2 enormous penthouses. Residences range from 2070 square feet to 4350 square feet, while the penthouses takes up more than 7,000 square feet each. The building is constructed from steel and sparkling glass and is the most recognizable feature in the area. The forty story Trump Hollywood by the Related Group and architect Robert M. Swedroe is found east of South Ocean Drive directly overlooking the city's namesake beaches and the Atlantic Ocean, one of several buildings in South Florida bearing the Trump brand. Enjoy more than 195 feet of direct beach frontage right behind the building. Trump Hollywood's porte-cochere entrance makes a grand statement with its water fountains. Once you step inside you'll come upon a two story lobby with design by the firm of Yabu-Pushelberg. Amenities throughout the building include a trio of tennis courts, cabanas by the ocean, a business center, billiards and multimedia room and much more. The two to five bedroom residences of Trump Hollywood come in flow through floor plans and have ten or eleven foot ceilings, floor to ceiling windows and glass railed oversized terraces as part of the residential features. Tennis courts overlook the Intracoastal Waterway, while the business center is fully equipped for convenience. A 24-hour concierge service and valet wis available to owners for their convenience, as well. A caf on property offers refreshments, while the wine cellar is fully stocked with rare vintages. A cigar lounge on property offers a refined taste of luxury tobaccos and the Club/Multimedia Room is a destination for the entire family. The bar area offers the best access to drinks and delightful snacks, as well. Walk along the shoreline and eventually you'll reach Oceanwalk Mall to the north of Trump Hollywood. To the northwest is Hollywood Boulevard which leads to the city's popular downtown area and includes Young Circle, a roundabout that has a park and a number of bars, shops and restaurants. The city of Fort Lauderdale is just a few minutes to the north and has an international airport. You'll also find Pembroke Pines and Aventura not far from Trump Hollywood, the latter home to Aventura Mall.